Many marketers want to map specialty metrics back to their paid media campaigns. Custom Conversions gives you the power to tie external conversions like leads or call tracking data to your AdWords, Bing, Facebook, LinkedIn, and Twitter campaigns through a simple CSV upload. What are some common uses for Custom Conversions? CRM Data: Map your leads, whether they're from Salesforce or another CRM tool, back to the account/campaign/ad set/ad/keyword they came from. Call Tracking: Do you track calls outside of the native networks? Bring DialogTech, CallRail and other call tracking conversions in through Custom Conversions. Revenue Data: See which ads are driving the most revenue. App Install Data: Do you track app installs with a third party tool like AppsFlyer? Easily bring installs, loyal users and any other important conversion to AdStage. How do I add a custom conversion? Step 1: Navigate to the Custom Conversions tab by hovering over the Data Management icon on the left-hand side of the screen. Step 2: Click "Create New Custom Conversion" in the upper right-hand corner of the page. Step 3: Download the Conversion File Template and start filling out the columns. Attribution: Set the weight of the conversion. Date: Add the date on which the conversion took place. Entity ID: Add the Entity ID of the corresponding account/campaign/ad set/ad/keyword. Easily pull a list of your Entity IDs by jumping into Report and creating a table widget, then export the table to CSV. Value: Enter the monetary value of the conversion. Step 4: Name your custom conversion. Step 5: Give your custom conversion a short description. Step 6: Choose if you'd like Aggregate Conversions ON or OFF. If you'd like the conversions to roll up to the levels above them, select ON. For example if you toggle aggregation ON, then upload ad level conversions, it will automatically show aggregated conversion data for the ad group/set, campaign, account, and network levels. Step 7: Click Upload File and see your new conversion in the Custom Conversions table. 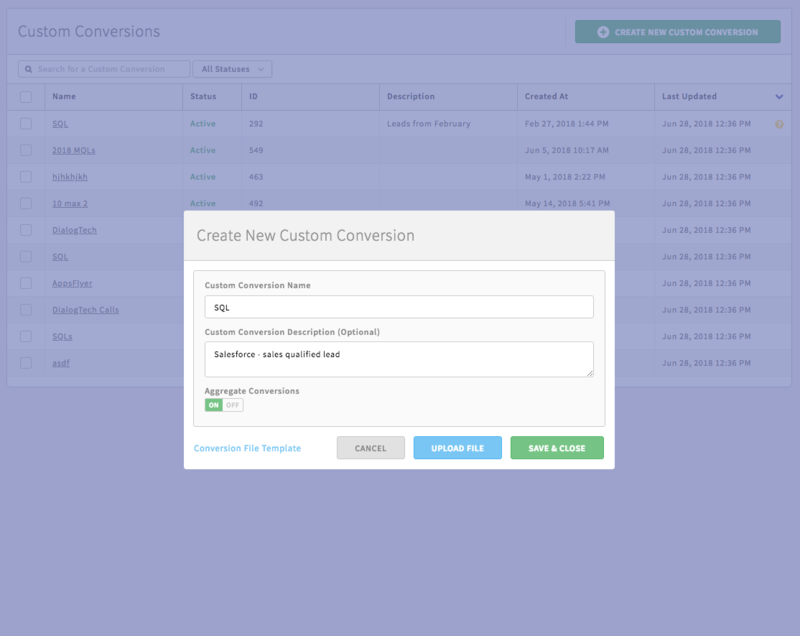 Step 8: After about 20 seconds, you should see your custom conversion in Report & Automate. Do conversions roll up to the levels above? Yes, they can. Toggle the Aggregate Conversions to ON for conversions to roll up to the levels above. Custom Conversions inherently roll up Account level conversions to the Network level, whether or not Aggregate Conversions is set to ON. To ensure a clean upload select your whole sheet and clear the formatting. If the Value column is formatted as currency with a currency symbol in front of the number, the conversions will be invalid. Double check column names. Use the exact column name from the template to guarantee valid conversions. Watch out for small formatting mistakes. Spaces after the Entity ID will cause an error in the conversion upload. Don't see your newly created conversion? Try refreshing the dashboard. Have dev resources? Automate the process with our Custom Conversions API. More info here. Have questions about getting started with Custom Conversions? Feel free to reach out to us at support@adstage.io.